NASN's Connection Cards are a tool for the school nurse to use to initiate meaningful conversations with students and parents/caregivers on topics related to anaphylaxis and epinephrine. The cards are intended to be printed on heavy weight paper – front and back. They contain 8 categories with conversation starters, questions, action items and topics for personal reflection. 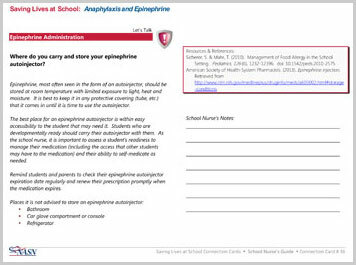 The Saving Lives at School: Anaphylaxis and Epinephrine handbook is a guide with evidence based information and resources that correspond with the Connection Cards to facilitate their use in school nursing practice. Page last updated October 2014.